Alan Knuckman — who called the market bottom in February — said what? Heart disease is the leading cause of death for people over 75. We start today’s issue off with a grim statistic — sorry to be such a Debbie Downer. The good news: “The cholesterol-lowering statin drugs can help protect against heart attack or stroke, both for people who have already had one and those who are at high risk for one of these events,” says Harvard Health Publishing. Statins have a long track record, too; they’ve been around since 1976 and proven effective for the prevention of cardiovascular disease. But statin drugs have had their fair share of controversy. “Their safety profile has also come under scrutiny, peaking in 2013 when two articles in The BMJ questioned their risk-benefit ratio… sparking a media storm,” according to The Pharmaceutical Journal. The concern? For years, patients complained about side effects that left them questioning if the cure was worse than the disease. “I have taken statins for several years,” Mr. Leedy continues. “I had extreme muscle pains; all that was done was adjust the dose. “Now I can hardly walk. What is the purpose of having low cholesterol and [being] unable to walk? “This problem of statin intolerance is one of the most vexing problems for both patients and physicians in cardiovascular medicine,” says Dr. Steven E. Nissen, chairman of the Department of Cardiovascular Medicine at the Cleveland Clinic. In addition to muscle pain — and, more seriously, muscle wasting — statins have also been linked to Type 2 diabetes, memory loss and liver problems. And the risk of side effects increases if patients have pre-existing conditions, including hypothyroidism, chronic kidney disease, diabetes and muscular disease. When side effects become intolerable, patients simply stop taking prescribed statins. “You can’t benefit from a medication that you’re not taking,” says Dr. Craig Bowron. “As many as 20% of people who start on a statin end up stopping, primarily due to complaints of muscle aches,” he says. “Researchers found that those who couldn’t tolerate a statin had a 50% higher risk of having [a] coronary heart disease event,” writes Bowron. Then there’s the alternative: “Over 610,000 Americans die of heart disease every year,” says Ray Blanco, who keeps us abreast of the latest medical technology. While around 40 million people use statins in the United States and around 220 million prescriptions are written yearly, that’s not always enough. Statin intolerance is a very real problem; add to that, “statins alone aren’t always enough to lower blood cholesterol levels in some patients,” says Ray. There are statin alternatives on the market — and they’re locking in big profits — but they’re expensive injectables. “A convenient, once-a-day pill would be a much more popular (and profitable) option for patients who need additional control or need to avoid statin drugs altogether,” Ray says. And it’s in clinical trials right now…. “So far the drug has already racked up an impressive number of successes” and “has a number of key catalysts over the next six–12 months that could put us in a position to reap profits in the hundreds of thousands of percent over the current price. In fact, according to Ray, “We’re just moments away from a potential application for a New Drug Application (NDA). [Ed. note: Not only is this incredible news for anyone who’s had to deal with the ravages of heart disease…but it could also hand you profits you’ve only dreamed of. Ray’s been following this story for years and believes you could add as much as $550,186 to your bank account. To the markets, where new home sales are just dreadful — down 5.5% for the month. Hmm… think rising mortgage rates — now over 5% for 30-year fixed loans — have a little something to do with that? As for the Dow, it’s in the red, down 113 points, to 25,078.09. The S&P 500’s down 24 points and the sell-off looks even worse for the Nasdaq; the tech-heavy index is down 106 points, to 7,330.83. Oil is up $1.11, to $67.55, but gold’s down $4.90, to $1,231.90 per ounce. Last, bitcoin is up $24.42, to $6,423.46. Alan Knuckman, our man at the Chicago Board Options Exchange, was featured yesterday on Neil Cavuto’s Coast to Coast at Fox Business. He stuck his neck out — calling another stock market bottom amid fraught price action so far this month. He successfully called the market’s bottom in February so….yeah. 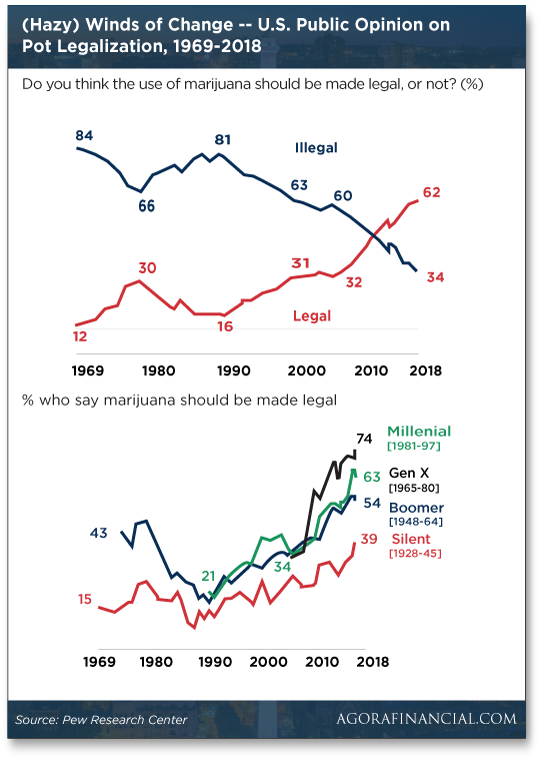 “The share of U.S. adults who support marijuana legalization is little changed from about a year ago — when 61% favored it — but it is double what it was in 2000 (31%),” reports Pew Research Center. The silent generation — ages 73–90 — are the least supportive population with just 39% favoring legalization, but even that’s up from last year. As for the breakdown along party lines, almost 70% of Democrats support legalization while just 45% of Republicans support legalization. Consider yourself an independent? Well, at least sorta? Left-leaning Independents favor legalization at 75% and 59% of their more conservative brethren support legal weed. We have strong reason to believe those ballot measures will prove the next catalyst behind a select few penny pot stocks. Watch this space next week for details on how you can capitalize. “While the lottery promises a chance—albeit a small one—to gain untold riches, it’s always going to be the government that benefits the most,” says an article at Reason. 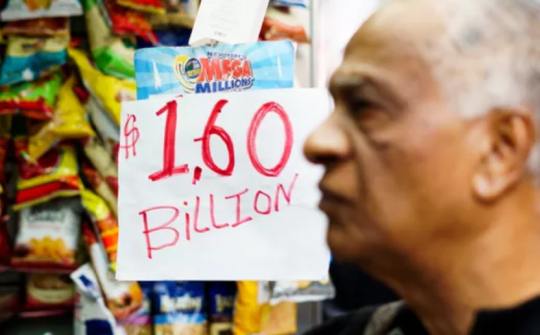 In a piece of major buzzkill reporting, the article says the odds of winning the $1.6 billion Mega Millions prize are 1 in 302,575,350. If you ponied up some cash for tickets, you might comfort yourself with the thought that your “voluntary tax” is supporting education. Think again. “Politicians often use lottery revenues to supplant school budgets.” That means lottery money just replaces what’s already been budgeted for education rather than augmenting the budget. “The education element mainly is a public-relations ploy to help people feel good about the dollars they spend on tickets,” says Steven Greenhut of R Street Institute. “Direct ticket sales aren’t the only way the government profits from the lottery system.” Not by a long shot — you know the taxman cometh. Which brings us to state taxes: “A total of nine states don’t take a cut of lottery prizes, but the tax rates for the remaining 41 vary,” says Reason. To give you an idea, New York taxes lottery winnings at 8.82% — that’s the highest in the country. The Palmetto State taxes lottery winnings at 7%. After everyone’s gotten their cut, last night’s lucky lotto winner will get about $490 million. Whelp, time to close for now… *grabbing keys and heading to the nearest 7-Eleven*… There’s always Powerball. “The most critical issue about condemning or sanctioning Saudi Arabia is that it could mark the end of the petrodollar, which could be the final nail in the dollar’s coffin,” a reader writes. “The willingness of the Saudi rulers to continue using the U.S. dollar as the only currency for oil sales (the ‘petrodollar’) causes the world’s nations to have 60% of their currency reserves held in U.S. dollars. “If the Saudi leaders were to end that system, U.S. dollars and U.S. Treasuries would be sold off large scale by central banks worldwide, causing interest rate increases in the U.S. and a large drop in the value of the dollar. Thus, even though the U.S. is trying to head toward oil independence, we are still hostages to the Saudis. “The petrodollar deal was made with the Saudis in 1974 to benefit the U.S. dollar because nations selling us commodities wanted to be paid in gold instead of dollars, which had been disconnected from gold in 1971 by Nixon. “The petrodollar deal is extremely beneficial to us but makes us hostage to the Saudi rulers. Thus, there is a practical limit to the extent that the U.S. will sanction or embarrass the Saudi rulers, no matter what morality dictates. The 5: All true… which is why we keep coming back to the question of whether the regime can even survive. In an article at The Independent, reliably astute journalist Patrick Cockburn compares the ’70s-era shah of Iran to present-day Crown Prince MBS of Saudi Arabia. “There are striking and instructive parallels between U.S… policy toward Iran in the lead-up to the revolution and toward Saudi Arabia in 2015–18. In light of which, Cockburn questions if Trump’s alliance with the Saudi kingdom — more than Russiagate — will be his undoing. That’s not without precedent, by the way. “The political debacle most similar to Trump’s ill-judged reliance on the crown prince and Saudi Arabia over the last three years was American policy toward the shah and Iran in the years leading up to his overthrow in 1979,” Cockburn says. Will a second term for Trump be “torpedoed” too? P.S. Don’t forget Next Wednesday the drug to disrupt the $19 billion statin industry is scheduled to go public with clinical trial results. Ray’s been following this story for years now and believes the opportunity to collect over a half million dollars in profits is just days away. Discover for yourself why Ray believes Oct. 31 might change your life forever.